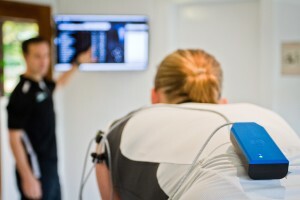 At Fit4 Physio we are proud to offer a complete 3D motion capture Retul bike fitting service. Whether you are into road cycling, time trialling or triathlon, having your bike set up correctly is essential to achieve optimal performance, efficiency, aerodynamics and minimise the risk of injury. Having your bike fitted properly, by a physiotherapist who is used to analysing movement all the time, can prevent pain that is common in the knee, hip, lower back and neck. So rather than trying to adapt your body to the bike we can help to accurately adapt your bike to your body. The Retul system is extremely accurate to with 0.1mm but it is only as good as the fitter completing your bike fit. As the only physio led Sheffield bike fit service using this system, you can be sure the accuracy and quality of our bike fitting is second to none. The Coast to Coast went really well, in no small part thanks to the bike fit. Not a single ache or twinge after 10.5 hours in the saddle! I went out for a little tester on Sunday and ended up doing 72 miles. I can happily confirm that there was no sign of the knee pain I experienced on the 2 rides before the fit, so looks like the setup is bag on. It’s amazing, thank you! I went out just for half an hour this evening and it felt so positively different! It was like riding a completely different bike. I had so much more control and better handling on the descents – I was able to go loads faster! Even on the flat I felt like I had more control. Uphill I felt like I had more power too. It’s been the best £175 I’ve spent in ages. Thank you so much. I just wanted to say thanks for the bike fit you did for me recently. I completed 4 decent rides in my week’s holiday, hitting some serious climbs (for me anyhow) and I had absolutely no pain in either my knees or my lower back and still don’t which has never happened before so I’m over the moon! Read more about the Retul bike fitting system here and find out how a proper physiotherapy led bike fit can improve performance and help you have a more comfortable ride. Also read here why it is important to have a physiotherapist with excellent cycling knowledge perform your bike fit.